The Geneva Deck Company custom designs decks and lifestyle environments. Whether you live in an estate from a by-gone era or are in the process of building a new home, we respect you and the uniqueness of your property. Designed to your specifications and wildest dreams, Geneva Deck will meet your needs and exceed your expectations. Premium PVC, Exotic Hardwoods and Composite decking materials offer many design options and solutions to uniquely transform your outdoor environment for both function and beauty. 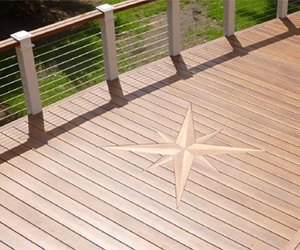 When deciding on a deck product, think about how much time and money you want to invest. Wood looks more natural, but it needs to be stained and weatherproofed frequently. Zuri® Premium Decking by Royal® combines the breathtaking look of exotic timber with a new definition for low-maintenance care.